8435 Level - Tri Mountain Surveyor's Safety Vest [8435 Level] - $66.15 : Sogowear Outfitters!, Polo Shirts, Golf Shirts, Jackets, Fashion Fleece, Woven Shirts and More! 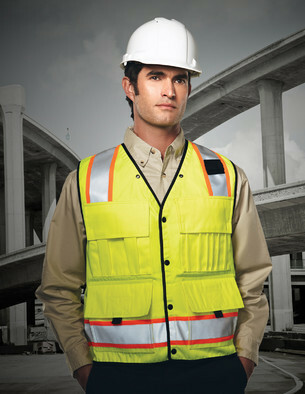 This ANSI Class 2 surveyor’s vest features a durable shell of windproof/water resistant polyester twill. Constructed with 2” 3M™ Scotchlite™ Reflective Tape, snap front closure, left mic loop and 2 lapel grommets. Chest pockets include a left 2-tier with 6 division pockets and flap, and a right 2-tier with 2 division pockets and flap. Two outside lower patch pockets with double entry feature flaps with pull tabs. Inside pockets include two lower with pull tab Velcro closures, and right chest patch pocket. Back pouches include an inner pouch with dual side zipper closures and an outer pouch with dual side snap closures. Hidden pouch reinforcement underneath ventilated back yoke. Meets ANSI/ISEA 107-2010 standards, Class 2/Level 2.